A hybrid between the sweet orange and the pomelo, grapefruit (Citrus paradisi) is a refreshing and delicious citrus fruit, rich in potent phytochemicals such as lycopene, beta-carotene and vitamin A. In addition to preventing retina damage and promoting vision acuity, the grapefruit helps lower cholesterol levels and protect against free radical damage. Even more, regular consumption of the fruit is believed to prevent the development of prostate cancer, while the small amounts of dietary fiber provide benefits for digestion, improve transit time, help relieve constipation and manage hemorrhoids. A few slices of grapefruit or a glass of freshly squeezed juice can be a wonderful start to an amazing day unless, of course, you have stomach problems such as gastritis, acid reflux or stomach ulcers and feel better avoiding acidic foods such as citrus fruit. The fruit is particularly rich in vitamins C and A, but contains small amounts of several other essential vitamins and minerals (folic acid, vitamins B1, B2, B3, B5, B6, calcium, copper, magnesium, potassium and phosphorus) which give it tonic properties. Unlike oranges or lemons, not all grapefruits are acidic. Moreover, compounds in the fruit have been found to interact with several medicines, so caution is advise when eating grapefruit and taking medication. What do grapefruits look like? The grapefruit is a hybrid between sweet oranges and pomelo, and a truly flavorful and healthy citrus fruit. It’s usually the size of several oranges or a melon, depending on the variety. Unripe fruit are green and turn either a light, green yellow, a mellow yellow or pink when ripe. The rind is usually thinner than in oranges and relatively smooth. A white, spongy pith or albedo is located in between the rind and the pulp. The pulp is segmented, like in orange and may or may not contain seeds. Depending on the variety, grapefruit pulp may vary in color from a light yellow or white to and pink to deeper red hues. The fruits with yellow rind and light-colored pulp are called white grapefruit, while those with pink-red pulp are called pink grapefruit. What does grapefruit taste like? Unlike most other citrus fruits, grapefruits are not all acidic. Some varieties have a strong acidic, slightly sour taste, while others are bitter. There are also more mellow-tasting grapefruits with little acidity and faint sweet-bitter flavors. So really, there is a grapefruit for everyone. But remember, grapefruits are still citrus fruits and, even though they may not be as piquant as oranges or lemons, even the most mellow varieties may contain small amounts of citric acid and upset those with stomach conditions. So if you are suffering from gastritis, acid reflux disease, frequent heartburn or stomach ulcers, it might be best to avoid citrus fruits altogether, especially the more acidic varieties. Learn more about what foods to eat and to avoid for gastritis. If you feel you can eat grapefruits without experiencing side effects, it’s best to go for the fruits with very little citric acid, usually the varieties that have a faint bitter-sweet taste and little sour flavors. Eating a few segments after a meal instead of prior to eating can also minimize side effects. Most grapefruit varieties are now seedless, although not all. Why am I telling you this? Because grapefruit seeds extract is believed to have potent antiviral and antimicrobial properties. 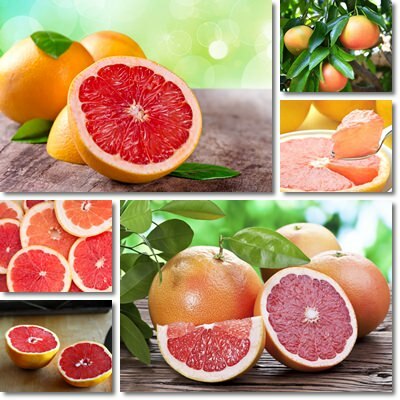 Although the mechanism has not been fully understood yet, it appears that grapefruit seeds extract stimulates the immune system, making it respond better and quicker to bacterial and viral infections. Normally, one regular-sized grapefruit can have up to a few dozen small, white seeds, similar to apple pips. Grapefruit seeds, pulp (without juice) and pith are all crushed and mixed together alongside glycerin and other preservatives to form grapefruit seeds extract. However, studies suggest that the antimicrobial properties of the seeds extract are a result of the addition of special preservatives that enhance the action of the antimicrobial compounds naturally present in the seeds. The fruit is a great mix of vitamins, minerals and phytochemicals with varied and beneficial health effects. Pink and red grapefruit contains lycopene, a bright red pigment also found in watermelons, tomatoes, carrots, papaya and gac fruit (see benefits of gac fruit). Lycopene is an antioxidant that combats free radical damage, especially from UVA/UVB radiation. Studies suggest it may also exert a preventive action against prostate cancer and potentially reduce risks of stomach cancer. Grapefruit juice contains naringenin and naringinin, two important flavonoids. Naringenin is a flavonoid with potent antioxidant and anti-inflammatory properties, know to reduce DNA damage caused by free radicals by 24% and boast antiviral effects. Naringinin is found in all citrus fruits and is responsible for the bitter taste of grapefruit. In vitro and animal studies suggest it reduces oxidative stress and angiogenesis risks and exhibits anticancer effects. Both naringenin and naringinin are found in generous amounts in grapefruit juice and are the source of numerous health benefits. However, know they may also interfere with the absorption of certain medication, which makes it imperative to consult with your doctor about the safety of eating grapefruit and drinking grapefruit juice if you are receiving medical treatment. Overall, grapefruit is a healthy addition to your diet, provided you can eat it without experiencing side effects. The fruit contains small amounts of multiple vitamins and minerals, notably vitamins C and A, calcium, copper, magnesium, potassium and phosphorus. As such, it contributes to a stronger immune system response, better eyesight, skin health and exerts a tonic effect. The varied B vitamin profile of the fruit recommends it for digestion and energy metabolism. Actually, the compounds responsible for the bitter taste of some grapefruit varieties stimulate the secretion of bile acid for digestion, further contributing to digestive health. The citrus fruit is also a source of dietary fiber, providing 1 g of fiber per 100 g of fruit and 2.5 g of fiber per cup and only 33 kcal per 100 g, or 76 kcal per cup of fruit. Regular consumption contributes to improved transit time and helps relieve constipation naturally, as well as promotes weight loss and helps maintain a steady weight. Because of its low energetic value and bitter taste, grapefruit is considered a great tool for burning belly fat. Last but not least, grapefruit contains pectin, a type of dietary fiber with cholesterol-lowering properties as well as a great remedy against both constipation and diarrhea. Overall, the fruit makes a great breakfast choice and dessert and we all know just how refreshing a glass of fresh grapefruit juice can be on a hot, summer day. Unless you are suffering from digestive problems that prevent you from eating citrus fruits or are under medical treatment and need to avoid medicine interactions, grapefruit can be a great addition to your diet and a source of many wonderful health benefits.